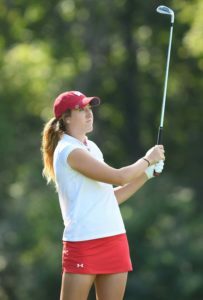 Despite having home course advantage, the Wisconsin Badgers womens golf team came up short in its quest to reach the NCAA National Tournament this week. The women’s team had to deal with windy and wet conditions that forced a shotgun start to the third day of the tournament Wednesday, and couldn’t make up enough ground to move into the top six spots at University Ridge. The top six finishers moved on to the NCAA national tournament. However, the ninth place finish by the Badgers was their best in a regional since 2014, and their 54-hole total of 874 was its second best this season. Their season scoring average of 292.25 was nearly four strokes better than the school record of 296.16 set last year. Individually it was a great day for UW Senior Gabby Curtis. She shot a bogey-free-4-under 68 to finish fourth and became the first Badger since 2001 to qualify individually. Curtis tied the 54-hole school record, with a 209 (-7), which was the best finish of her career and her fourth career top 10. She will break Kris Yoo’s school record for rounds played at 138. Curtis will head to Stillwater, Oklahoma and take part in the NCAA Championships May 18-23 at Karsten Creek Golf Club. She is the second Badger to ever advance to the NCAA championships as an individual. The WIAA announced on Wednesday that the University of Wisconsin will remain the primary home for the association’s state championships for the next seven years. The WIAA and the UW signed a contract extension that will allow boys basketball, football, wrestling, boys and girls golf and softball championships to call Madison their home through 2025. Just a week earlier, the WIAA announced an agreement to holds its state girls and boys volleyball and girls basketball at the Resch Center in Ashwaubenon through 2025. Boys basketball is the longest running tournament on the UW campus, dating back to 1920.